What will my crossword puzzle look like when I print it? A subscription to make unlimited crosswords costs $5/month, or $4.25/month when billed annually. You can try it free for 30 days before deciding if you want to subscribe. Click the green 'Make Printable' button at the top left of the page when you are ready. 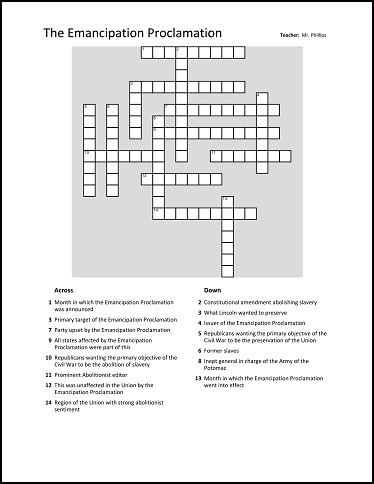 Individual crosswords can also be purchased for special events. Many things on the internet are free. Why not this? In general, it’s possible to be the best or the cheapest but not both. We chose to be the best. We respect that many people prefer the cheapest, and this may not be the site for them. But if you want the best, you’ve come to the right place. Yes. If you are not satisfied for any reason, you can have a full refund. Click the green 'Make Printable' button in the top left of the page when you are ready. You will be prompted to create an account if you haven’t already, and then see payment options. Once paid, you will have a big green 'Preview + Publish' button that will put your crossword puzzle in a format that can be printed or solved online. Your account is needed to access your saved crossword puzzles later, and to ensure you can always publish your crosswords when you’re a paid user. Additionally, our save-as-you-go crossword puzzle maker will save to your account, so you can resume your crossword puzzles in case of computer issues. Yes. All crosswords created with the crossword puzzle maker are saved to the cloud and accessible from any computer when you log in. Where are my saved crosswords? When logged in, click on the 'My Puzzles' link in the header to see your saved crossword puzzles. Crossword puzzles you are working on can be found in the “Crosswords I’m Making” section, and crosswords you’ve completed can be found in the “Crosswords I’ve Published” section. Can my crossword puzzle be solved online? Yes. All crossword puzzles receive a permanent link, and you can share the link with your solvers so that they can print it or solve it online. Can I keep my crossword puzzle private? Yes. When you finalize your crossword, you have the option of adding a password. You can keep this password private or share it only with your designated solvers. Can I print a word list? Yes. You have the option to print the list of answer words with your crossword puzzle. Do I own the rights to my crossword puzzle? Yes. Crossword Hobbyist will never make money from your work. Can I embed crossword puzzles in my website? Yes. Crosswords you create and publish on Crossword Hobbyist can be embedded and solved on YOUR site. Here are some super-easy instructions to embed a crossword in your site. Vocabulary words, science concepts, etc. Contains references to friends/family, inside jokes, etc. Puzzle saved to your account! After your 30 day trial, you will be charged .